The pink and white stripes are my favorite! Love love the bedroom, I want one for me!! Love these! I am re-doing 2 french chairs in a similar cabana stripe fabric-- just in blue. Simply lovely, wish it were mine! I love all of these picture! I dream of the day when I can have a home that is full of bright cheery colors that make me feel happy! Wish my apt looks that preppy. Wow. Those are all just gorgeous. those are all just simply perfectly preppy, they are all beautiful! Um, yeah. I need everything in all these pictures plus a beach-side home! I love these rooms - so pretty! Oh... I love the pink dining room. So cute. I love all of them! Just my style! I love the paint color pink in the first picture...all these pics are so relaxing. makes me want to go to a seaside paradise right now! Can I have all of this??? 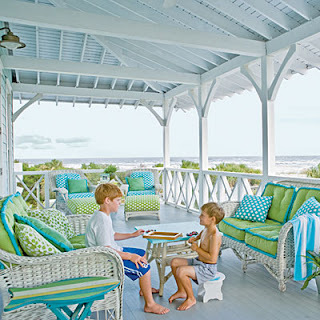 Who could want more than preppy beach living?? I'm in love with these photos, especially the room with the pink and blue window treatments. Coastal Living always pleases! 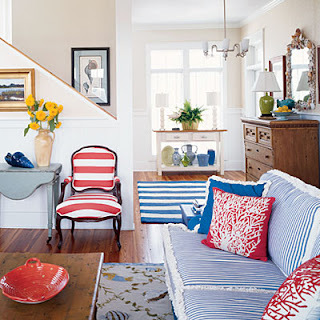 Very nice, Coastal Living is one of my favorite mags! Omg all of these pictures are AMAZING!! oh my. I love all of these! They are spectacular. I may need to paint my room pink! 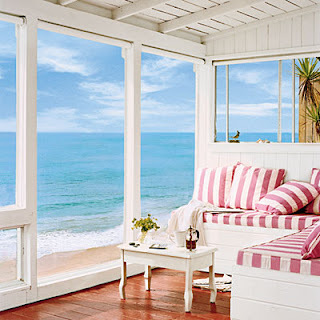 Ohhhhh, to be able to sip my morning coffee in that seaside room. Sigh.